Autism Hour In Omagh - We Need You! There are 700,000 autistic people in the UK. Along with their families, that’s over 3 million customers waiting to be welcomed into your business. Over 99% of people have heard of autism, but only 16% of autistic people feel the public understand them. 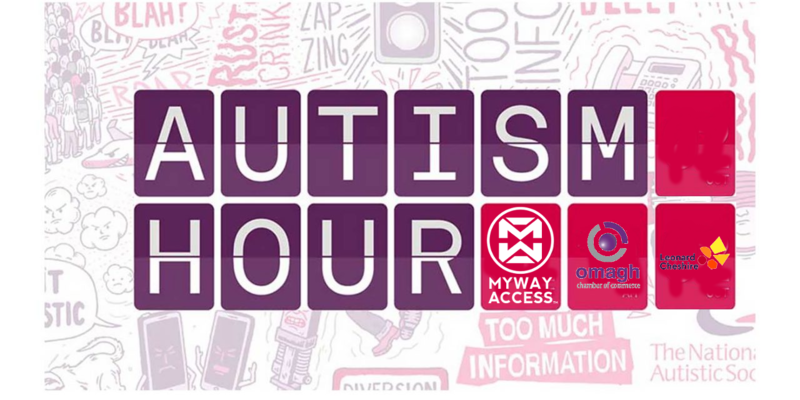 So, My Way Access, in conjunction with Omagh Chambers and Leonard Cheshire Omagh, are asking shops and businesses to organise an Autism Hour in Omagh and take simple steps for 60 minutes that lead to a more autism-friendly world. What’s involved in an Autism Hour? Turning down music and other noise: overwhelming noise is a common barrier to autistic people accessing shops.Where possible, in-store tannoy announcements and other controllable noise should be reduced. Quiet Zone: If possible, create a quiet zone in your store for autistic people to take a break. Sharing information about autism with employees: we don’t expect everyone to be an autism expert but we believe everyone should try to understand autism. Customer Awareness: we will ask you to put signs up during the hour to let other customers know about the scheme and to highlight that it is meant to be a calm environment for shoppers. Can I get involved now? Absolutely! We want to support businesses that want to run their own Autism Hour during the month of April. To register you interest please contact Dermot Devlin at info@mywayaccess.com or Bronagh Gormley at admin@omaghchamber.com.